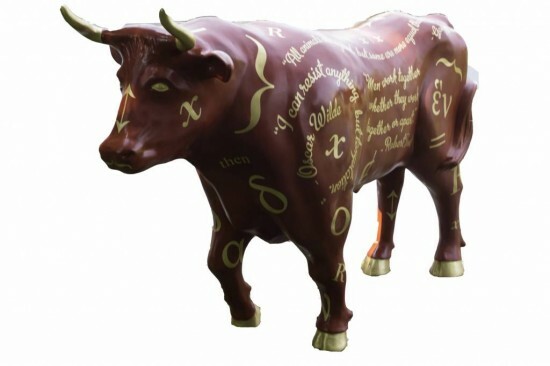 My ox is criss-crossed with traditional literary, mathematical, and philosophical paradoxes inscribed in rich, gold typography that follow the pattern of an ox plowing a field. A paradox is a statement that apparently contradicts itself but, upon reflection, might be true. Layered with meaning, each paradox provides an immediate impression of impossibility that gives way to deeper critical thinking about the potential validity of the statement. Typography is a powerful element of design that also offers a dual sensation comparable to that of a paradox. On one level, the type conveys content that engages high-level thought, on another more subconscious level, the swirls and curves of the type conjure visual associations that can evoke nostalgia, memory, and feelings, depending on a viewer’s frame of reference.